FCF is an all-volunteer group. We have no paid employees. 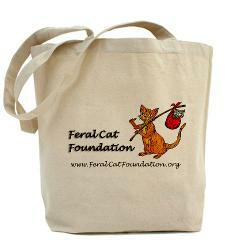 There are many ways that interested people can contribute to our mission of helping feral cats. Buy Bissell Products and help save cats! Donate a vehicle for FCF! Shop or Sell Online for FCF! E-Scrip is an easy, automatic way to generate funds for FCF every time you do your normal shopping. Participating merchants include Safeway, Gene's Fine Foods, Whole Foods, Pet Food Express, Eddie Bauer, Sharper Image, Big O Tires, Budget Rent a Car and certain hotels. You can search/browse the list of participating merchants or view the newest merchants from E-scrip's Merchant's Page. Feral Cat Foundation will automatically get a percentage of your purchases: 2-10%, depending on the merchant. More merchants are being added all the time. The donation comes from the merchant, at NO COST TO YOU. You can register online at www.escrip.com. Use the FCF Group ID: 137829111. Click "Signup" then enter 'Feral Cat Foundation' and follow the instructions. There is NO registration fee! Use this online shopping portal and a percentage of all the money you spend goes directly to Feral Cat Foundation. Start shopping now! If you shop on-line, check out www.onecause.com. Hundreds of online merchants participate in most localities and donate a percentage of your online purchases to FCF! Checkout the List of Merchants when you access the site. To register, go to the onecause.com website, click on "JOIN" to register and then it will let you choose your cause (Feral Cat Foundation). Once you are registered, go to your account page and download the OneCause toolbar. This toolbar will ensure that FCF will receive a contribution whenever you shop at a participating merchant. If you do not use the toolbar, you must remember to sign into OneCause.com first and then click on the merchant's link from the merchant list to enter the merchant's site. Feral Cat Foundation is proud to be a Partner for Pets! BISSELL and LostPetUSA.net have teamed up to help organizations like ours raise money, and now you can help too! When you purchase pet products on bissell.com and enter the code ADOPT at checkout, a portion of your purchase will be donated to our organization! Donate your car, truck, RV, motorcycle or recreational vehicle to Car Donation Services Inc. – and FCF receives 50% of the net proceeds once the vehicle sells. For more info, please call (925) 229-5444 or visit the CDS website. Do you ever buy or sell things on eBay? If so, there is a great new way to help the kitties! FCF has partnered with eBay Giving Works and MissionFish to enable online auctions benefiting FCF. MissionFish is a nonprofit organization that works with eBay to manage the donation process. If you want to shop to benefit FCF, visit www.MissionFish.org and enter "Feral Cat Foundation" in the search box at the upper right, then follow the links to FCF's page. Click on "Learn More" to see the current eBay listings for FCF. (Auctions change at least weekly, so you may want to bookmark this page and check back from time to time.) From this point, it works just like buying any other item on eBay. At the end of the auction, pay the seller as usual. MissionFish does all the back-end work to ensure the donation reaches FCF as promised! If you are an eBay seller, you will need to create a seller account with MissionFish and provide a credit card number to guarantee your donations. This is easy to do at www.MissionFish.org. Then, go to eBay and simply create your auction listing as usual. On the listing template where it says "Donate a percentage of sale," select Feral Cat Foundation from the drop-down box and choose the percentage of your final sale price you would like to donate (minimum donation is $5, and MissionFish does retain a small portion of this to pay for their operations). When the auction is complete, you can remit your donation to MissionFish, or have them charge your credit card automatically. For more information on the program, please visit www.MissionFish.org. Happy trading! Your Donation is Secure and Private. 97% of Your Gift Goes Directly to FCF. Would you like to have a sweatshirt or T-shirt with our adorable hobo cat and kitten logo? Click to find out how to order. "Come From the Heart" is a company that provides excellent long distance service at extremely competitive rates and returns 5% of your monthly phone bill to Feral Cat Foundation. Because "Come From the Heart" is not affiliated with any one phone company, it can offer its customers the long distance carrier that best meets their needs. Click here for details about this opportunity to save on your phone bills and help FCF.